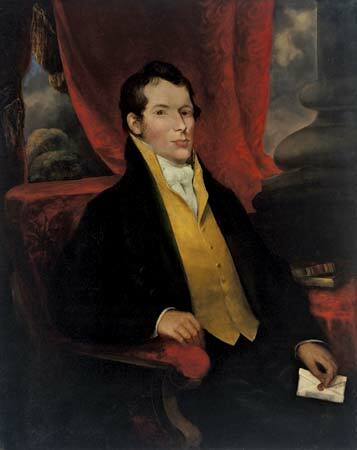 John Macarthur was born 1767 in Stoke, Devon, England, United Kingdom to Alexander Macarthur (c1721-?) and Catherine (-1777) and died 10 April 1834 at Camden Park in Menangle, New South Wales, Australia of unspecified causes. He married Elizabeth Veale (1766-1850) October 1788 in Bridgerule, Devon, England, United Kingdom. Ancestors are from the United Kingdom. He arrived in New South Wales on the Neptune in the Second Fleet with his wife and infant son as a soldier.